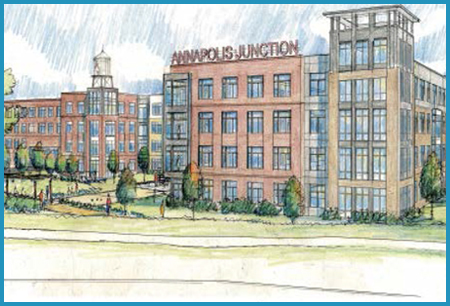 The Annapolis Junction Town Center project encompasses approximately 18.8 acres of land located in Howard County, Maryland. 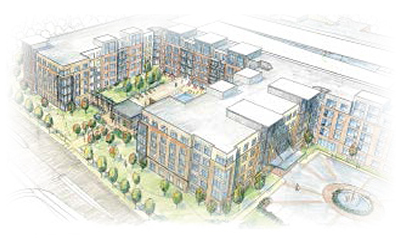 The site is adjacent to the Savage MARC commuter train station and is being developed as a transit-oriented development and mixed-use project. The development, with nearby access to Maryland Route 32 and the Baltimore-Washington Parkway, MD 295, is proposed to include approximately 416 apartment units, 100,000 square feet of office, 14,250 square feet of in-line retail space, a 150 room hotel, 3,200 square feet of bank or restaurant type space, and two private parking garages. Upon completion, it is estimated that approximately $144 million will be invested in the Annapolis Junction Town Center project. The State of Maryland previously owned 12.73 acres of the 18.8 acre site, which was primarily used for the Savage MARC Station as surface commuter parking and related uses. A former lumber yard occupied 5.96 acres, and approximately 0.16 acres was owned by Howard County. For the private development to proceed, the developer committed to constructing a new public commuter parking garage for the Savage MARC Station to be owned and operated by the State of Maryland. In turn, the State is to convey 9.30 acres to the developer to complete an assemblage of land for use in constructing the private development. In 2014, Howard County issued bonds in the amount of $17,000,000 as a limited public offering. The bonds will finance the construction of the state owned commuter parking garage containing approximately 704 spaces, certain other public improvements including roads, curbs, and gutters, water, sewer and storm facilities, and improvements to the Savage MARC Station. Security for bonds includes tax increment revenues, a pledge of BRAC (Base Realignment and Closure) revenues from the State, and a back-up special tax. Other sources of financing for the project include debt and equity. Tax increment financing functioned as a redevelopment tool, facilitating the transformation of underutilized land in a strategic location. Financing the construction of the state owned garage made available the remaining land for the private development. Prior to the issuance of bonds, MuniCap, Inc. served as financial advisor to the County and assisted the County in developing guidelines and principles for public investment to ensure a disciplined approach to investing public funds in the Annapolis Junction Town Center project and other future projects. To that end, MuniCap assisted the County in developing the TIF plan of finance and assisted in determining that the planned development met the guidelines and principles established for public investment. Once bonds were issued, MuniCap, Inc. transitioned into the role of administrator for the districts. As administrator, MuniCap, Inc. prepares continuing disclosure reports, updates the annual budgets, monitors IRS compliance, and determines the application of the special tax methodology.